Anatolian Shepherd Dogs, or simply Çoban Köpeği (translates to Shepherd Dogs, as they are known in Turkey), are an ancient landrace breed. Their history dates back 6000 years to the Anatolia region, now Turkey. The breed predates the Turkish occupation of Turkey or Anatolia. So, to infer that the Turkish reference of “Çoban Köpeği” is the most correct name for the breed is in fact doing an injustice to the the history of the breed. In most parts of Turkey the role of these dogs is livestock protection. They are and can also used be as property guardians. Depending on the area, climate, topography and main predators, the dogs are bred to and have adapted to have different characteristics. This is simply the basis for the many varietal types/names used for the dogs by Turks. Anatolians should have a strong-willed yet stable temperament. They should not be over reactive. They should be able to determine appropriate force to deal with situations at hand. 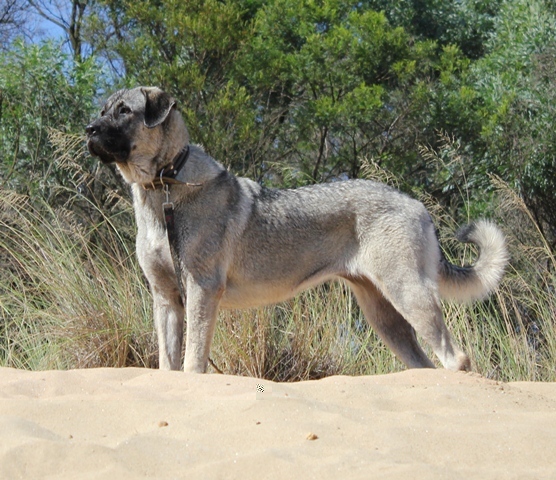 Like all breeds recognised by western kennel clubs, like the Australian National Kennel Club (ANKC), the Anatolian Shepherd also has a Breed Standard. What is important to note with this breed, as with any other working breed, the dogs should be “FIT FOR FUNCTION”. This includes having the physical characteristics as well as the mental capacity to perform the duties they have successfully done for centuries prior to Western breeding practices. Q. Do they eat a lot? A. Not much relative to their size. They are not a high energy expending dog. They can also be known to be fussy, and not overeaters. It is important to their long term health that they are never overweight. Q. Do they need grooming? A. To an extent. They are a double coated breed, and will shed some hair all year round. Twice a year they will shed heavily, and a good brushing will help remove old coat. However, they will not matt, and could be left without grooming. Q. Are they good with other dogs? A. The safest generalisation is to say they are not a ‘dog park dog’ once mature. There are of course exceptions to this, but the breeds function and purpose is not a social one. They tend to be fine with dogs they have been raised with, but will generally be the top dog. Q. Do they need much exercise? A. Your breeder should guide you, but it is agreed that exercising a young giant breed dog is not conducive to long term joint health. A. Yes, they are highly intelligent, perceptive, intuitive and independent. But also aloof, so don’t expect a ‘Border Collie style’ quick to respond to your every menial request. Do not expect an ASD to be a diligent recaller off lead either! In general, an ASD in a domestic environment needs to a strong, committed and ideally experienced dog owner.